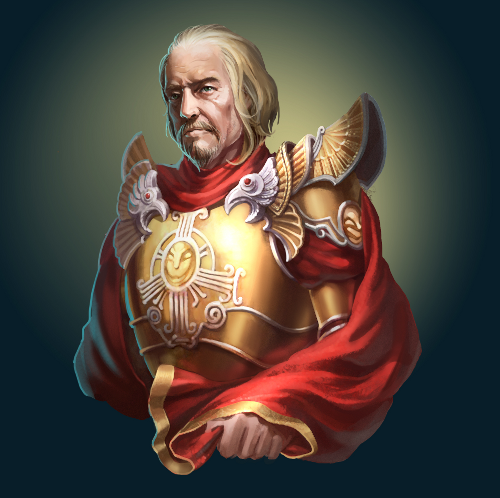 - Lord Haart appeared in Might & Magic 2 and Heroes 1, 2 & 3. - Maximus appeared in Might & Magic 3 and 7, and Heroes 1 & 2. - Adelaide appeared in Heroes 3 & 4. - Moander appeared in Heroes 3 & 4. - Luna appeared in Heroes 1, 2, 3 & 4. - Ludmilla appeared in Clash of Heroes. - Kaspar appeared in Heroes 5. - Nymus appeared in Heroes 3, and in the M&M novel The Sea of Mist. Her bio lampshade the existence of another (male) hero called Nymus in H5. - Lorhish appeared in Clash of Heroes and might turn into Grawl from H5. He is named after Capybara's composer Sean Lorhish. - Jeddite appeared in Heroes 3 & 4. His bio mentions he saw under Kha-Beleth's helmet, which mirrors his original bio which mentioned he saw the demon king Xenofex' true face. - Xana appeared in Dark Messiah. - Atlas appeared in Might & Magic 5 and Heroes 1 & 2. - Kalindra appeared in Might & Magic 5 and Heroes 2. - Ciele appeared in Heroes 3 (Armageddon�s Blade). - Tazar appeared in Heroes 3 & 4. - Shiva appeared in Heroes 3 & 4. Her bio mentions the Dragon Utopia (classic Heroes location), the Sunken Temple (from H5), the Tomb of a Thousand Terrors (final dungeon of Might & Magic 4 and 9) and the Thunderbird (Stronghold unit in Heroes 3 & 4). - The hero Mokka is named after a restaurant in Budapest where Ubi and BH teams had dinner a few times. - The hero Umberto is named after Umberto Eco. His character is similar to Eco's William de Baskerville from The Name of the Rose. - The heroes Igor and Gritchka (seen in Haven 2) are named after Igor and Grichka Bogdanoff. - The hero Erika is named after the late Erika Walters (a.k.a Flamestryke), who hosted one of the most complete websites dedicated to the M&M RPGs before she tragically passed away a few years ago. - The hero Harald is named after M&M fan Znork. - The hero Eduardo is named after M&M fan Vitirr. - Sir Jaywoods the vampire is a pun on James Woods (who appeared in the movie Vampires) and also the name of a place near Kurt McClung's hometown in Indiana. - Cordelia is named after the character Cordelia Chase from TV series Buffy and Angel. - Montbard the Red Templar is named after Andr&#233; de Montbard, one of the founders of the real-world Templars. - Ishtvan Griffin is named after Istvan Zsuffa, Black Hole's Creative Director. - Acamas is named after the Cyclops of the same name that appear in Greek mythology. - Zhaoyu is named after M&M fan EvilP (aka Moyue). - A necropolis town in the map Stronghold 3 is named Abin-Sur in reference to a comic-book character (one of the Green Lanterns). - Castle Portmeyron in Inferno 4 is named after Portmeyrion, the village of the TV series The Prisoner. - The town of Seahaven in Inferno 4 is named after the city of The Truman Show. - Several towns are named after towns that appeared in previous Might & Magic games. - Most of Stronghold town names are real Maori words. - Many Inferno town names are based on demon names from the Ars Goetia (Lesser Key of Salomon). - The icon for the Taunt ability looks a lot like the "Rude Frenchman" from the movie Monty Python and the Holy Grail. - Angelic Alliance was an artifact in Heroes III the Shadow of Death. - Sword of Whistlebone was an artifact in Might & Magic VIII. - Iron Feather was an artifact in Might & Magic VII. - Souldrinker is based on an unused concept art from Dark Messiah. A different Souldrinker sword appears in Dark Messiah as well, hence the reference to several cursed blades bearing the name. - The Staff of Sandro is obviously named after fan-favourite hero Sandro. - Many artifacts are based on classic artifacts from the Heroes series. - The Guardian Set is similar to the Battle Garb of Anduran, the very first artifact set that appeared in Heroes 2. - Crag Hack's helmet is a reference to fan-favourite barbarian hero Crag Hack. - In Stronghold 4, there's a quest to find the wreck of the "Jolly Raven", a pirate ship sunken "25 years ago". Finding the wreck of the Jolly Raven was one of the quests of the original Might & Magic RPG 25 years ago. - In Inferno 2, a Quest is titled "Secret of the Inner Sanctum", the subtitle of the first Might & Magic game. - Mandate of Heaven is a reference to Might & Magic 6: The Mandate of Heaven. - Solmyr's Student is a reference to fan-favourite hero Solmyr ibn wali Barad. - The Gathering Storm is a reference to the first add-on to Heroes 4. - Festival of Life is the name of a campaign in Heroes 3 Armageddon's Blade. - Follow Me If You Want to Live is a reference to a line from the Terminator movies. - Foolhardy Waywardness is the name of a campaign in Heroes 3 Armageddon's Blade. - For Blood and Honor is a reference to Might & Magic 7. - Day of the Destroyer is a reference to Might & Magic 8. - Disciple of Sheltem is a reference to Sheltem, the first Big Bad of the Might & Magic games who destroyed whole planets. - Ironfist is a reference to the Ironfist dynasty of Varn and Enroth. - Dwarven Treasury I, II & III are a reference to an adventure map location seen in Heroes 3. - Dragon Utopia is a classic adventure map location of the Heroes series. - Clunkfest is a reference to a comment made by M&M fan Dreamwright on the forums (about some units having such over-the-top armors it was becoming a "clunkfest"). - In Yog's Footsteps is a reference to fan-favourite hero Yog, a former Wizard who rejected magic to become a barbarian. - Gryphonheart is a reference to the Gryphonheart dynasty of Erathia. - Back in Black is a reference to a song by AC/DC. - Terminator is NOT a reference to the movie of the same name but to an enemy seen in the old Might & Magic RPGs which could exterminate party characters. - Nobody is Left Behind is a reference to Disney's Lilo & Stitch. Really. - The Untouchables is a pun in reference to Eliott Ness and his crew. - Demolition Man is a reference to the Stallone/Snipes movie of the same name. - Requiem for a Dream is a reference to the movie of the same name. - The Pusher is a reference to a song by Steppenwolf, featured prominently is the movie Easy Rider. - Quick and Furious is a reference to the movie franchise The Fast and the Furious. - Several classic items can be seen on the Hall of Raiders and Artifact Merchant buildings: Armageddon's Blade, the Lion Shield of Heroes II and Lord Kilburn's shield seen in Might & Magic VI. - In Necropolis 4, a signpost mentions Lord Kilburn's maps of the desert being the most accurate. In Might & Magic 1, the player needed to find Kilburn to obtain a map of the desert. - The underground city of Sarkomand and its "winged lions" (Lamasu) is a reference to a place seen in HP Lovecraft's Dreamlands (especially The Dream Quest of Unknown Kadath). - In Haven 3 a signpost is dedicated to Zedd, an M&M fan who passed away during the production of H6. - In Inferno 1, some signposts contain references to the movie Princess Bride. - Several references to fan-favourite Barbarian hero Crag Hack in signposts, and mentions of his feud with Baron Rufus. Rufus is the name of Varkas' dog in Clash of Heroes, so Varkas might be a descendant of Baron Rufus himself and named his dog after his famous ancestor. - Various references and (very probably bad) puns in Quest names. Edited by Negativland at 17:40, 26 Jun 2012. It seems that Archibald won this time . Edited by DoubleDeck at 12:21, 27 Jun 2012.